If you’re anything like me you love receiving samples and freebies in the mail, but sometimes you can’t use the items right away and they start to pile up. Or maybe you order a product because it’s such a good deal (or free) only to discover you don’t really have a use for it once it arrives at your door. I hate the thought of wasting anything, so I’ve come up with a few uses for my surplus of samples. Travel – I have a container under the sink in my bathroom where I save extra trial-sized toiletries to use when traveling. I do this for a couple reasons. First, I never have to worry about leaving my make-up, toothpaste or deodorant at a hotel if I was just using samples. And second, I never have to worry about the size restrictions on liquid items when flying. If you don’t travel much consider giving some of those extra toiletries to a friend or family member who does. Donations – You can save snack food, vitamin, baby, personal care or other samples to donate to a charity or non-profit of your choice. Some places to consider are women’s shelters, children’s hospitals, or organizations that provide care packages to military troops over seas. Gifts – This one can be tricky. No one wants to seem like a cheapskate, but some of these free sample items can be really nice! I would suggest making gift baskets out of like items. You can get cute baskets and containers at the dollar store. 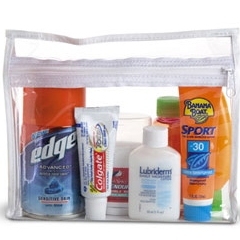 Try putting snacks and toiletries into a gift set for a recent high school grad about to move into a dorm. Or put vitamins, pain relievers and bubble bath samples into a gift set for a friend who’s feeling under the weather. The possibilities are endless. Regardless of what you do with your freebies just remember not to be wasteful. The packaging and transportation alone used valuable natural resources, and it would be a shame if the product just got thrown away or forgotten in a closet. Plus, I think we all know how easy it is for our best organizing intentions to get side tracked by excess clutter. As frugal people we don’t want to needlessly hoard items, but to be prudent and prepared. Emily is a mother, wife, non-profit administrator and freelance writer – usually in that order. She blogs about her experiments combining attachment parenting, green living and real life at www.crunchyishmama.blogspot.com.